Dancing Queens are a critical part of the Dancing with the Students program. These volunteers become partners with the students. When a student’s partner is absent and/or there may be more boys or girls in a class, a Dancing Queen becomes his/her partner for the class. Some weeks, they may dance the “lady’s” steps… some weeks, they may dance the “gentleman’s” steps… but every week, our Dancing Queens are guaranteed to have SO much fun!! Not a problem! 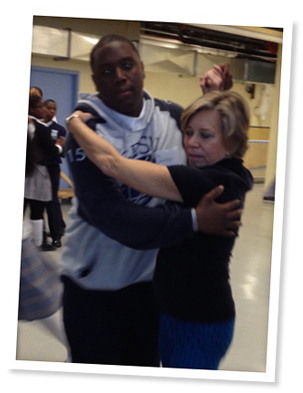 Our dance instructors provide free instruction and training to our Dancing Queens and Dancing Kings, too! Interested in becoming a Dancing Queen (or King)? Click here to download our application form. For questions about becoming a Dancing Queen or Dancing King, click here! “I LOVE getting to know the kids! And I LOVE seeing how much better they get each week! And I LOVE seeing them treating each other with more respect.